The Australian federal police are currently investigating three federal politicians and had a win in the Federal Court in the Peter Slipper/Mal Brough/James Ashby matter on Thursday (19/5/2016) which is the same day they raided the offices of Senator Stephen Conroy and a Labor Party staffer’s home. Early in the week Federal Liberal National MP Stuart Robert, who is also under investigation by the AFP, was busted corruptly stacking the Gold Coast Council with LNP people while they claimed they were independent. The Australian Federal Police raides on Thursday night were in relation to leaks in January from a government department regarding cost blowouts at the National Broadband Network (NBN). This embarrassed Prime Minister Malcolm Turnbull as he previously had responsibility for the NBN when he was the Communications Minister. The police raided a Labor Party staffer’s residence and Senator Stephen Conroy’s office who was previously the Communications Minister before the 2013 election. The Labor Party’s lawyers have claimed parliamentary privilege on the documents seized by the police and it will now be up to parliament to decide if the police can use the documents in their investigation. There is an argument that the police raids are over the top as the information leaked was in the public interest. The other argument is that if the police allow the leaking of the documents when will the leaking end. 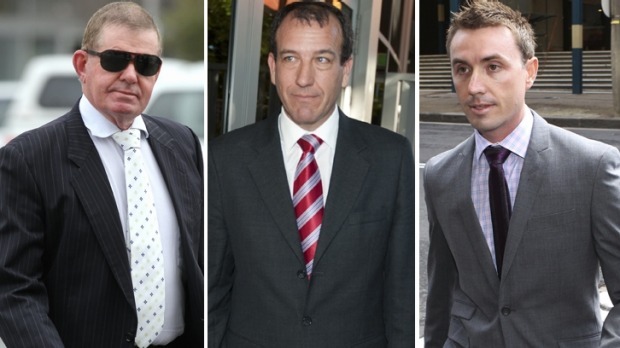 It is a big coincidence that the raids happened only a matter of hours after Justice Geoffrey Flick handed down his judgment giving the police access to text messages in the Peter Slipper / James Ashby sexual harassment case. The text messages will be used in the AFP’s investigation of federal MP Mal Brough who is retiring at this election. The NBN leaks are also covered by Section 70 so Senator Stephen Conroy and Mal Brough should be able to be tried at the same time and save taxpayers some money but unfortunately the law probably wouldn’t allow it. With the amount of evidence that the public have already seen against Mal Brough and with his confession on 60 Minutes it is not a matter of if he will face criminal charges but just a matter of when. A FEDERAL Police investigation into dumped minister Stuart Robert’s China trip has surprised his colleagues, who fear it will be an embarrassing distraction during the upcoming election campaign. Stuart Robert is obviously a major criminal with his fingers in many pies as the above and below show. He comes across as the Eddie Obeid of the Gold Coast. On Tuesday (17/5/16) the ABC’s 7.30 Report broadcast a story which showed Mr Robert corruptly stacked the Gold Coast Council election in January with two of his own staffers. The staffers claimed they were independent for the election but were financed $30,000 each from a slush fund controlled by Mr Robert called the Fadden Forum. They all claimed they were independent of each other which is a lie. The below video is the 7.30 Report story on the Gold Coast Council election stacking and well worth watching to see how democracy really works when the fix is on. Corrupt Liberal Party crony Nick Di Girolamo on Friday (20/5/16) discontinued the defamation case he instituted against Fairfax Media which I wrote about in my last article (Thursday – 19/5/16). As I said in the article Nick Di Girolamo was always going to lose and it would have become very embarrassing for the Liberal Party as well as the Labor Party. I think a lot of people were looking forward to seeing the former NSW Premiers and Arthur Sinodinos in the witness stand but that won’t happen now which is lucky for them. The federal election is starting to heat up and become the “Corruption Election” that it was meant to be. Every which way you turn there’s another crook or criminal being exposed trying to get elected or run another scam. The widespread media exposure is good for democracy and I am sure the smaller political parties and independents running in the federal election are loving it as it is mostly Liberal and Labor Party corruption being exposed. If the Liberals and Labor don’t clean up their mess soon they might not be around for much longer. We have to many rules and regulations scrap them all and let the bun fight begin. It is not hard to see and figure out the truth about the corruption revolving around the Gold Coast City Council when one has been living in the place for nearly 30 years. There was a time when a mayor was head of a council, and with a population of around 555,000 residents in the Gold Coast City there is a CEO who has to pass the time in his office to justify his salary of over $500,000, slightly less than the salary of Australia’s prime minister, and more than the salary of Barack Obama. As previously $$$$$$$$ won the election, not skills, abilities, resident concerns or even common sense. “Oh,what a tangled web we weave when first we practise to deceive”The scum always rises to the top. Fairfax Media can reveal Ms Hay is resisting the directive to quit and the matter is likely to have to be put to a vote of the NSW caucus on Wednesday. GOLD Coast MPs Stuart Robert and Steve Ciobo are “the million-dollar men” who use little-known fundraising vehicles to deliver the biggest election war chest for the LNP in Queensland. So hidden are the donations to the Fadden and Moncrieff MPs it is impossible for the entire money trail to be traced through party disclosure returns to the Australian and State electoral commissions. But interviews with party insiders, along with searches of transactions, explain how the donations and the donor cannot be traced. The Coast funding is critical to the party with the system ensuring both MPs will survive any scandals because it will be funnelled into campaigns in marginal seats north of the Glitter Strip. That sort of money over a four-year term would equate to a $1 million war chest.